This research study involved the use of extensive secondary sources, directories, and databases, such as D&B, Bloomberg Businessweek, and Factiva, to identify and collect information useful for a technical, market-oriented, and commercial study of the industrial gearbox market. Primary sources are mainly industry experts from the core and related industries, preferred suppliers, manufacturers, distributors, service providers, technology developers, standards and certification organizations, and organizations related to all the segments of this industry’s value chain. The points given below explain the research methodology. After arriving at the overall market size, the total market has been split into several segments and subsegments. The figure given below illustrates the breakdown of primaries conducted during the research study, based on the company type, designation, and region. Some of the leading global manufacturers of industrial gearboxes are Siemens AG (Germany), Bonfiglioli Italia S.P.A (Italy), Bondioli & Pavesi (Italy), Sew-Eurodrive (Germany), and Dana Brevini (Italy). 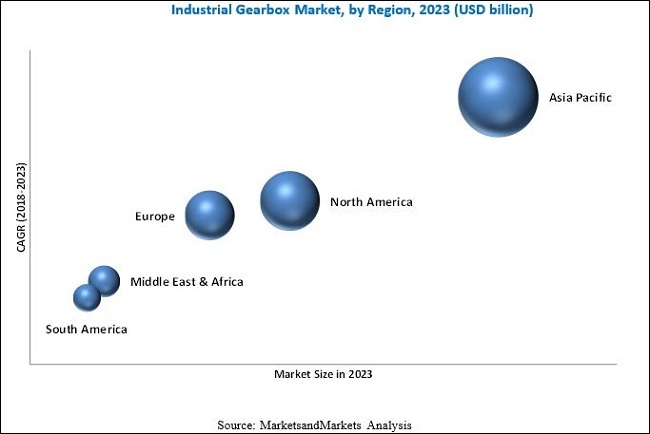 The global Industrial Gearbox Market is estimated to grow from USD 25.91 billion in 2018 to USD 31.90 billion by 2023, at a CAGR of 4.25% during the forecast period. The growth in the industrial gearbox market is driven by the increasing automation in manufacturing industries such as automobile, food processing, and agriculture machinery. In addition, increasing investments in renewable power generation, with a skew towards wind power, is driving the market. In this report, the Industrial Gearbox market is segmented on the basis of type into planetary, helical, bevel, spur, worm, and others. The planetary gearbox segment is the fastest growing segment by type in the industrial gearbox market because of the vast application of this type of gearbox in wind turbines, steel plants, and various industries such as food and beverage, mining, and cement. These gearboxes are used in a wide range of applications such as port lifting equipment, mixers, pressure feeder, defuser, and crystallizer. The growing investment in food and beverage industry and mining and cement industry in Europe and Asia, respectively, is driving the growth for the planetary gearboxes. The Industrial Gearbox market is further segmented on the basis of design into parallel, angular, and others. The parallel segment is projected to hold the largest market share in the industrial gearbox market. The helical and planetary gearboxes, which hold the substantial share of the industrial gearbox market, are manufactured using the parallel axis design. Thus, the parallel axis segment is expected to hold the largest market share. The market has been segmented on the basis of end-user into wind power, cement & aggregate, chemical, rubber & plastic, construction, food & beverage, marine, material handling, metals & mining, power generation, recreational vehicle, transport industry, agriculture, automotive, and others. The wind power segment is expected to grow at the fastest rate in the industrial gearbox market. The growth in the wind power segment is driven by the increasing investment in wind power installations in Asia Pacific, North America, and Europe. The Industrial Gearbox market is analyzed with respect to five regions, namely, North America, Europe, Asia Pacific, South America, and the Middle East & Africa. Asia Pacific region is estimated to dominate the Industrial Gearbox market in the forecast period. The market in Asia Pacific is expected to hold the largest share and is forecast to grow at the fastest rate during the forecasted period. The region holds the largest market share globally as the countries such as China and Japan are among the largest manufacturing countries in the world. In addition to this, the projected installation of wind power and the growing automation in the manufacturing industries in the region is driving the growth of the industrial gearbox market in Asia Pacific. The major factor restraining the growth of the industrial gearbox market is the slowdown of the major economies in the European region. The technical challenges are also acting as a restraint for the growth of the market. In this industry, most players are global multinational companies. Some of the leading global manufacturers of industrial gearboxes are Siemens AG (Germany), Bonfiglioli Italia S.P.A (Italy), Bondioli & Pavesi (Italy), Sew-Eurodrive (Germany), and Dana Brevini (Italy). 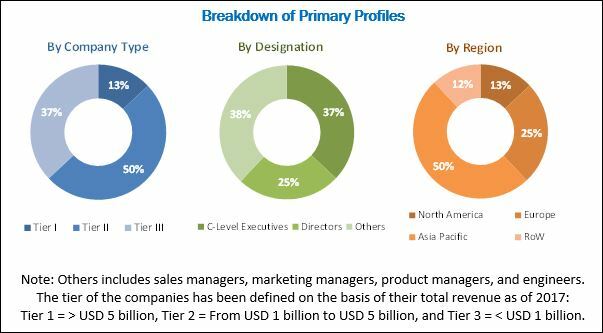 These players have adopted growth strategies such as new product launches and contracts & agreements to capture a larger share in the industrial gearbox market. 11.5 Sumitomo Heavy Industries Ltd.
11.6 Watt Drive Weg Group. 11.16 China High Speed Transmission Equipment Group Co., Ltd.